One of the best things about being a child is that time lasts so long and that there is so much to do that one soon forgets about things. 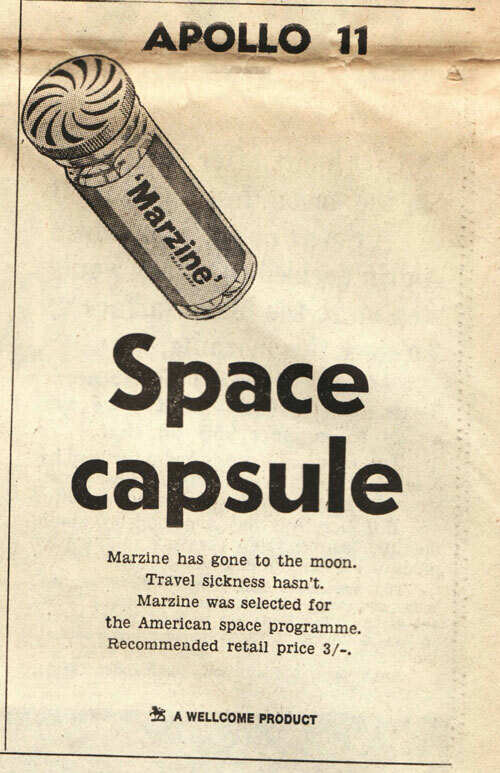 As described in the last entry, my parents entered a competition on my behalf, the first prize of which was a flight to America to see the launch of the next Apollo mission. Whilst it was true it was always at the back of my mind that I might win, in the meantime I just got on with other things. We didn't win of course but I don't recall not winning. The possibility just faded from sight. This didn't affect my obsession with space flight in the least. I was still hooked and for someone with such interests it was an exciting time to be alive. These nocturnal interludes became a regular thing over the next couple of years - I wanted to be woken up for the launches, landings and splashdowns (I was unable to sleep properly and had nightmares during the ill-fated Apollo 13 mission's journey back to Earth). I also clearly recall looking up at the moon visible in the blue sky the next day after school and thinking to myself "There are people up there". 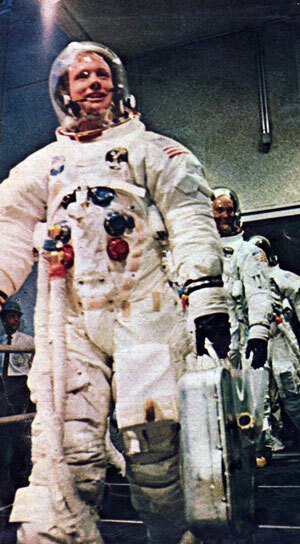 When we got a dog I wanted to call it Buzz after Buzz Aldrin. I drew endless pictures of the Saturn V stack and knew all the details of the mission. I even knew what a trans lunar injection burn was. The world had Moon fever. 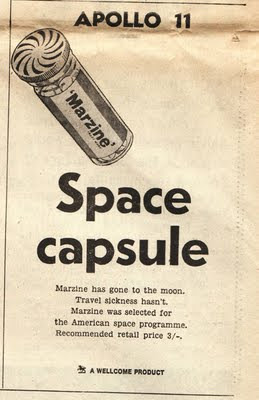 Adverts at the time would use wafer-thin tenuous links to the moon missions to sell tights. The toy shop down the road had a telescope in the window with a hand written notice "SEE IT!" sellotaped to the tripod. Even as a quite young child I was sceptical about this. Surely a telescope that small couldn't be that powerful and subsequently would be completely incapable of spotting the small craft heading across the abyss to our closest planetary neighbour? The TV coverage itself was exciting and comforting at the same time; the familiar avuncular figures of Patrick Moore, Cliff Michelmore, Reg Turnill and James Burke presided over the kind of sets normally dedicated to rolling coverage of sports or politics. Apollo got blanket coverage which made the Radio Times listings exciting. All the missions had their own logos and would take over the available channels in a manner of which Big Brother or X Factor could only dream - there were only three channels and Apollo dominated all of them. These days it's hard to imagine anything other than international sport or lowest common denominator talent shows being given this much coverage. Have we lost interest in matters more exciting and cerebral? I would hope not. The problem is that the human race has stopped making planet-sized gestures such as Apollo. 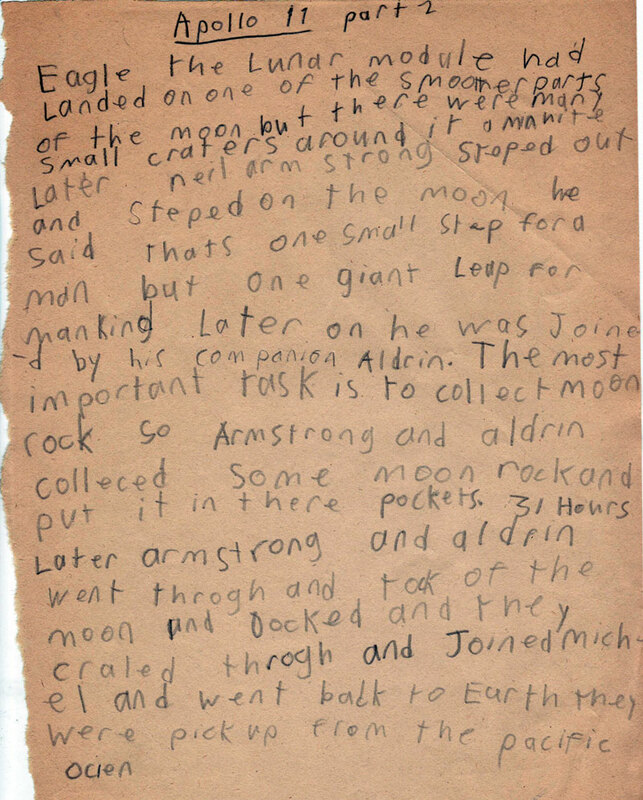 Despite the Cold War element of the moon shots when it came down to it and Armstrong stepped onto the surface of the moon people forgot their differences and perhaps for the first time thought of themselves as members of a species rather than of a nation state. We can only hope that it wasn't the last time such an enlightened outlook will become widespread. Humanity needs to do something astonishing to recapture the perspective. Sometimes a photograph of a pale blue dot just isn't enough. That was the thing though. Back in 1969 people were rightfully astonished by this momentous achievement but for me the moon seemed around the corner. 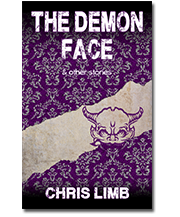 Whilst I was consumed with interest in the missions, to me it seemed like popping down the streets to the chemist rather than the longest journey ever undertaken by man. The Manned Flight to Mars, that was what excited me. The Race Into Space (Man's First Fifty Steps Into The Universe) picture cards that came free with PG Tips had this exciting undertaking as number 50; the pinnacle of the space race and one that I had no doubt would be undertaken well before I was old enough to have a chance of being included on the crew. 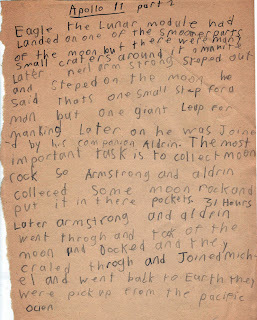 My early ambition was Space Correspondent and I was hopeful that not only would I get a job with the BBC but that I would be posted to the moon or no doubt to the the 100 Man Space Base in Orbit which Reg Turnill's book had promised would be reality by my early twenties. Was this a pipe dream, the hopeless ramblings of an adolescent USA or was it all possible and all that happened was a failure of imagination and finance? It felt like the whole human race simply lost our nerve. Let's get it back before it's too late.